Raise the Barre Bra in Teal Green and Aeon. 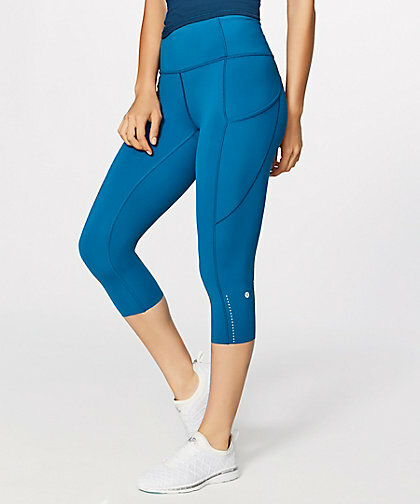 Lululemon is supposed to releasing some "vintage" styles and this is the first piece we've seen - The Throwback pant. They remind me a bit of the old Fit pant from years ago. 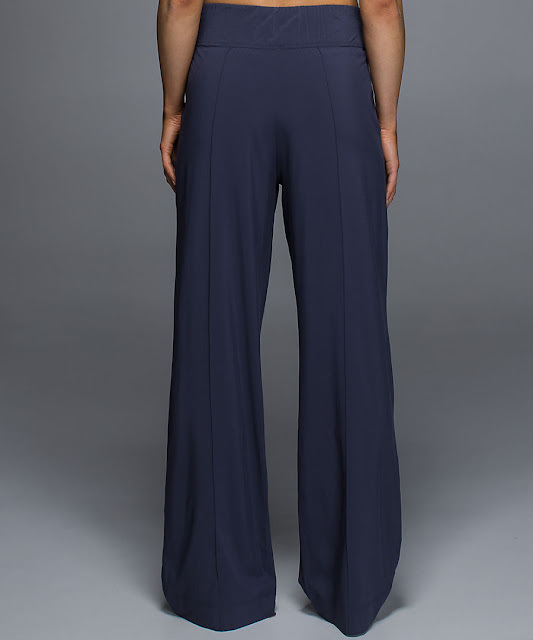 I ordered a pair of black pants to try since my favorite version of Groove pants are getting up there. Noir Pants, made of Swift. 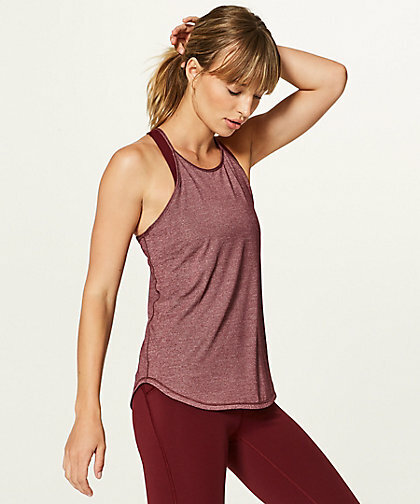 Raise the Barre Tank in pretty Viola. Deep Rouge 7/8 Wunder Under Pant, shown with a Deep Rouge Energy Bra. Fast and Free Crops in Capri Blue. Deep Rouge Hotty Hot Short Long. 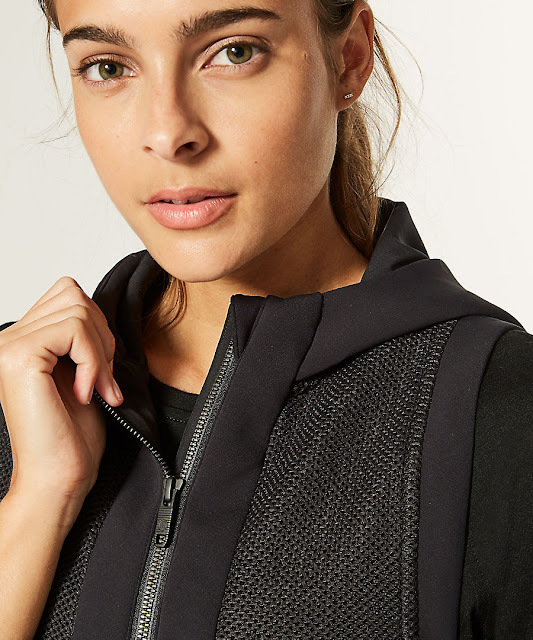 Like the Windshell, shown in Pelt and Black. Just the Throwback Pant for me today. Did you get anything? Noir Pants?!!! I love my Noir Pants! To be honest, I kinda forgot about them, but they were a Lab release from ... 2013? I can't remember exactly, but I know that I have them in both colors, already hemmed, somewhere in my dresser upstairs. So excited to be reminded of them and wear them again! Not so crazy about the rest of the upload. The strappy part of the bra is cute, but I think I need more coverage in front. 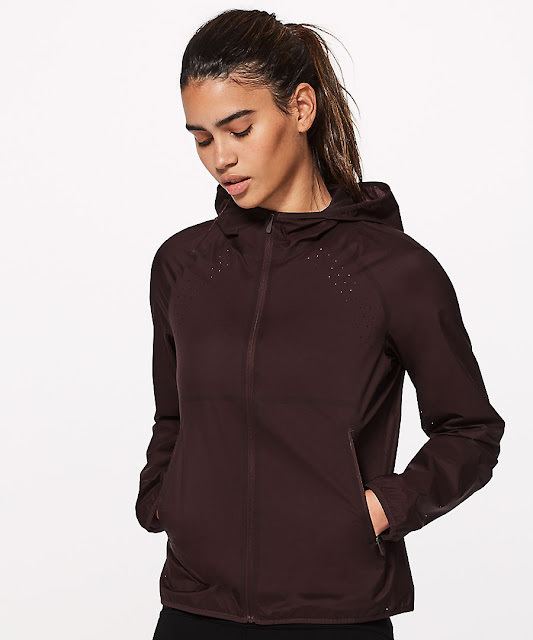 Tried on the Contour Jacket the other day, and it's awesome, but I don't really need a jacket in any of the dark neutrals it's offered in. Would love a rich berry color. Or Aeon Blue. I shouldn't hold my breath. Still, the jacket itself is a winner. I got 2 Love Tee crew's in dusky lavender and mineral blue. Such pretty colours. But the last month has been so blaaaaah lately. I'm holding out for Energy Bras and Free to Be Zen Bras in Dusky Lavender, Aeon, Teal Green, and Deep Rouge. Otherwise, nothing interested me. The Raise the Barre bra seems to be a slightly different version of the Deep Stretch Bra. 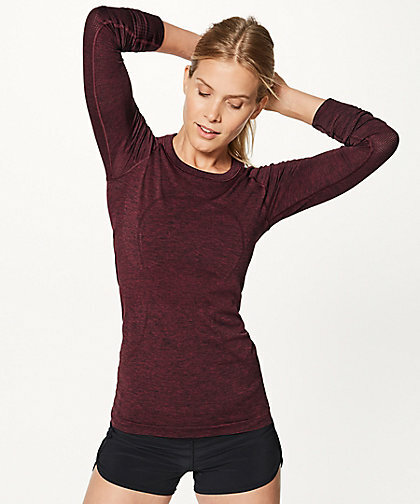 The neck neckline of the Raise the Barre bra is too high. I don't like bras that hug around the back of my neck. And I don't like the bikini-style sports bras like the Raise the Barre. I prefer shelf bras. Anyone else think the Amalfi Blue Energy Bra looks like the Lakeside Blue Energy Bra from WMTM/Warehouse Sale? The Lakeside Blue bra has a beige lining, though. Nothing from this upload but I finally caved and got the Round Trip Jacket in Melanite and the Define in Melanite from last week. I've been waiting for a dark grey NOT heathered/patterned jacket so I will try both to see what I keep. I love the Round Trip details - reminds me of the old lulu! Maybe that's one of their "vintage" bring back pieces? Nothing for me, which is the new normal for me for LLL for quite some time. The Raise the Barre bra looks lovely in Teal Green (the tank also looks pretty but I go for more fitted tops like the CRB original). But, I have no use for the strap that goes across the neck and see that as being an irritant. I miss the FTBW bra. what the crops with the spaces in between vest? i like those! 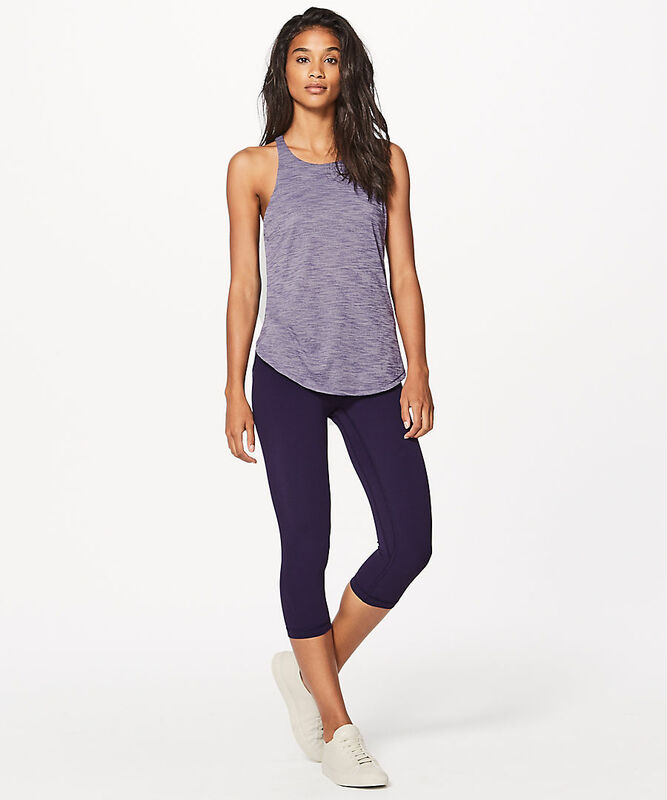 Looks like a new align color is previewed with the Raise the barre tank in viola. I hope we get that purple color soon! 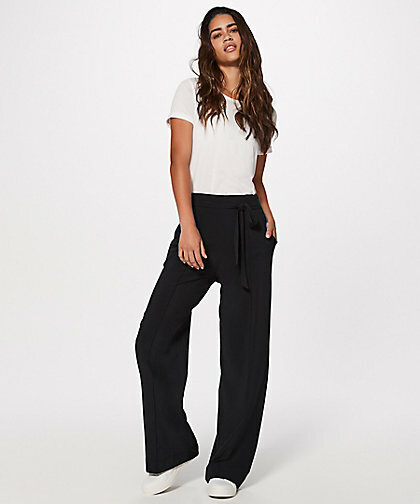 @Rise and Shine, I was thinking about getting the Noir Pant. Since you own them and love them, can you tell me why? Is it TTS? Anyone else have feedback for the Noir Pant? I think I like the Raise the Barre Bra, but since it is for B/C cup women, and they show it on A cup models, it is hard to say. Even on the models it looks very low cut - I am surprised it is supposed to fit B/C?! I love the contour jacket! Hi LLA, can you elaborate on what you have heard regarding LLL bringing back some vintage styles? Is this to coincide with their 20th anniversary next year? So people like the Noir Pants? Could you wear them to work? Do you need to be tall to pull them off? anon@8:52, I like that the Noir Pants are comfortable and flattering. They hold up well - they can be tossed in the dryer - and yet they look polished. I think they're a sophisticated silhouette and very versatile. A lot of the time when Lulu does streetwear, it's a very young look. This is fine, since that's their target market, but every once in a while they come out with something with more range, which I really appreciate. @anon 8:52 Inhave the noir pants in cadet blue from years ago. When I saw them back up on website I proceeded immediately to my store to pick up the black. So cute and flattering on. They are extremely high waited so they look best with crop tops. Which as great as everything this year is cropped so I wear these tops with noir pants and they look great and I don't have to show belly!! Light as air, wash like a dream and my cadet blue ones still look brand new. They don't wrinkle easily either which is a bonus. Easy to dress up or down. They do run tts..
Yaaay, I hope the Noir Pants will make their way to Australia. I missed out on them a couple years back. :( They are super flattering and effortlessly chic.